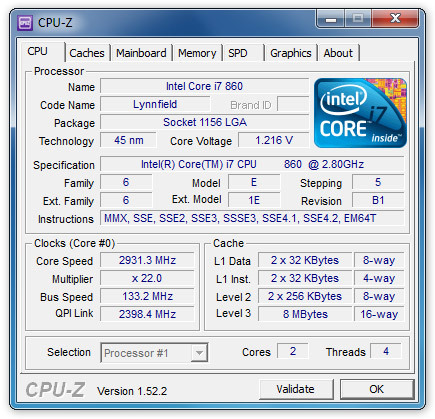 CPU-Z is a diagnostic tool that provides information on your CPU, including: processor name and vendor, core stepping and process, processor package, internal and external clocks, clock multiplier, partial overclock detection, processor features, supported instructions sets, L1 and L2 cache information, location, size, speed, and technology. Comprehensive tool, very useful when you want detailed info about your computer. Very good, helps a lot. Very useful, beware of tool-bar installation though as mentioned below. Remember that if you deselect 'install ask toolbar' but leave other ones like set my home page to ask.com then it might still install toolbar. Previous version failed to load due to beta expiration. This version fixed the issue perfectly. I've been using this tool to identify chip-set components and verify CPU speed scaling in my Intel i7 laptop. Regarding the previous poster, though I dislike programs that bundle the Ask Toolbar as much as anyone, unselecting the checkbox during setup DID stop the toolbar from being installed in my case. CPU-Z its a great program. CPU-Z betas are time limited, so the MOST RECENT VERSION NO LONGER FUNCTIONS. This is dumb. Was using speedfan to check system specs before, this is much better. @rafu: oh gosh, i hate no-clue complainers like you. There is also an executable version that just runs on the fly. Yes, Betanews should post that one instead. Why do you need an instalation just for 1 exe file! v1.51 worked fine on my pc. v1.52... crashes before it even starts up. really hope they fix this app, its a must have for anybody.